Today, we are adding a new feature into Photopea: the support for RAW images. RAW images are very popular among photographers. Unlike regular "web images" (like JPG or PNG), they contain raw information from the camera sensor. Such information can be processed in many ways, to generate many different regular images. 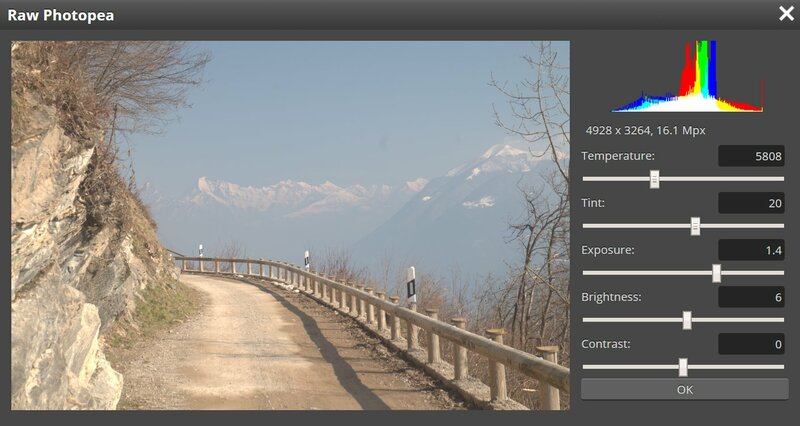 Photopea supports the DNG format of raw images. When you open such file, you will see the Raw Photopea window. Here you can change some additional parameters. After you hit OK, Photopea will generate a regular image out of your raw file, and will open it as a new PSD document.